You can select the location, name, and format of your scan file on the File Save Settings window. You can also select various optional settings that control how Epson Scan behaves when you scan and save files. 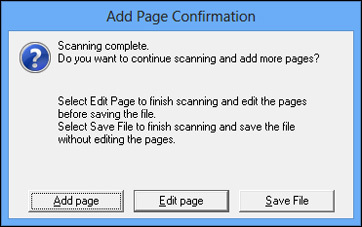 The File Save Settings window may appear after you click Scan on the Epson Scan window. You may also be able to access the window by clicking the icon on the Epson Scan window. Click the button for one of the displayed folders. Click the Other button, click the Browse or Choose button, and select a folder. If you want to change the default name for your scanned image, click Edit and select the options you want. Select the file format you want to use in the Image Format Type menu. If your file format provides optional settings, click the Options button to select them. Choose any of the optional settings you want to use by selecting their checkboxes. If you are scanning only one page, click Save File. If you need to scan additional pages in a document, click Add page. Place additional pages on the product for scanning, click Scan, and repeat until you have scanned all the pages. When you are finished, click Save File. If you need to delete or reorder the scanned pages, click Edit page. Delete or reorder the pages using the icons that appear on the bottom of the editing window. When you are finished, click OK. Note: If you installed an OCR (Optical Character Recognition) program, you may see a screen indicating the program is converting your page to text. Wait until the program re-scans the page and close the program, if necessary.